Storage Tauranga. Our moving history. Storage-that-comes-to-you. 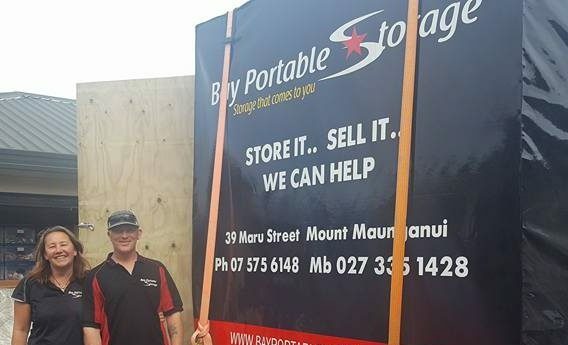 Bay Portable Storage was created to help save our customers valuable time and money. Our goal is to provide you with both a superior customer experience and tremendous value for our customers. We are a husband and wife team with reliable on call staff. We have been in business together for over 9 years. Over the years we have built up an excellent reputation and our focus was to make sure that our customers got the best customer service we can give. We will always going the extra mile to make it happen. Having dealt with many customers in the past who were either moving, downsizing, had deceased estate lots, we know how much work it is to load and unload furniture and valuable goods. We felt that this could be done easier and faster and in a more cost-effective way. We know how precious your items are to you and always take the utmost care of your items. Our focus is to keep everything simple and cost-effective. We bring the Portable Storage box to you. You pack it at your leisure (within 24 hours). We pick it up when you are ready and store it inside our secure 24 hour monitored facility. We can also give you a quote on items that you no longer want to keep, purchase them from you, or sell on behalf. We appreciate all our customers and welcome your feedback and suggestions. Use our Contact Us page to tell us what we’re doing right or what we can improve on, or drop us a line on Facebook.